Let's see how you can use your personalized MyPlate to make healthy food choices. Here's a typical breakfast bought at a local drive through. Let's find out where each part falls on MyPlate. The bagel equals 4 grain servings. The egg is a serving from the protein group. The bacon is also in the protein group. And the cheese is one dairy serving. This breakfast may sound good to you; you're starting your day off with food from three food groups. But the choices made are high in fat and processed grains not the healthiest foods you can find. Start by making half your grains whole. Trade in the large, white flour bagel for one made with whole grain, or a whole grain corn tortilla. One scrambled egg from the protein group can be topped with black beans, and salsa to add taste and help you vary your veggies. Orange juice or half a grapefruit will help you focus on fruits and low-fat milk will help you get calcium-rich foods, while watching your waistline. By making these choices, you're getting a variety of foods from more food groups. And your choices are healthier. For lunch, try a smoked turkey pita sandwich with lettuce, tomato and mustard. Add one cup of tomato juice to vary your veggies and finish it all off with apple slices and low-fat yogurt. Half your plate is fruits and vegetables. If you crave an afternoon snack, try whole wheat crackers for whole grains. Low-fat yogurt or pudding can be a great snack, or keep dried fruit at your desk to help you get your daily fruit servings. For dinner, try grilled lean steak, mashed potatoes with heart-healthy margarine, steamed carrots, a whole wheat dinner role, a glass of fat-free milk and some fruit for dessert. Sounds like a pretty tasty dinner! Not in the mood for steak? Try a pasta meal instead. Whole wheat rigatoni with a lean-meat tomato sauce topped with grated cheese can make a delicious, healthy dinner for the whole family. After dinner, get away from the TV or computer and walk with your family or choose another activity you enjoy. Whatever you decide to eat, keep MyPlate in mind. 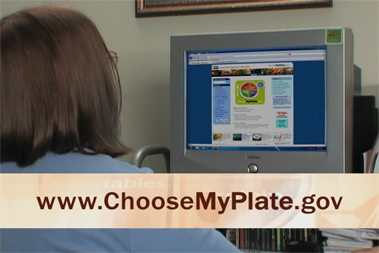 Check out the website HYPERLINK "http://www.ChooseMyPlate.gov" www.ChooseMyPlate.gov when you're planning your meals. It has many great examples of healthy meal choices and you can even build your own sample menus and track your food choices. If you have trouble using the website a registered dietitian can help. Choose healthy and move every day. Soon you'll be on your way to preventing weight gain, and serious diseases like heart disease and diabetes. MyPlate can help you become more healthful and stay that way for life.